This is the first of five pages showing off women’s “Union Suits” that would keep Her warm during the cold winter months. 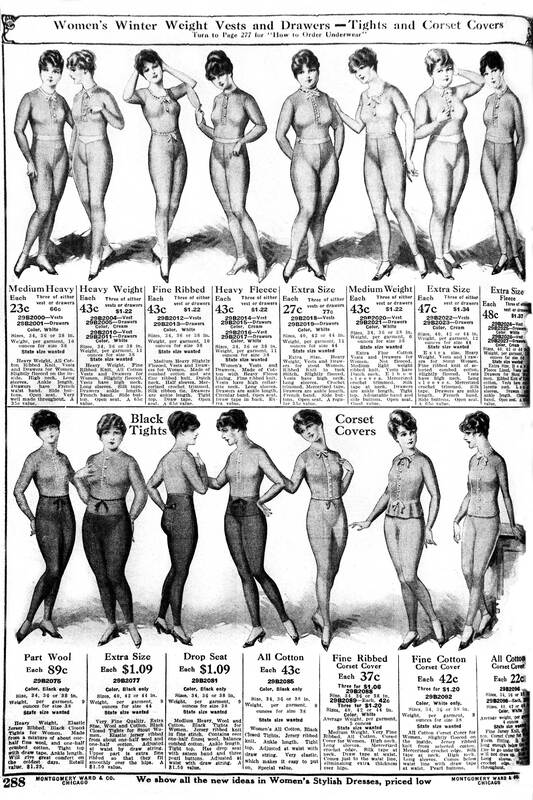 It’s a page that reveals more about the female shape than was usually seen in public. 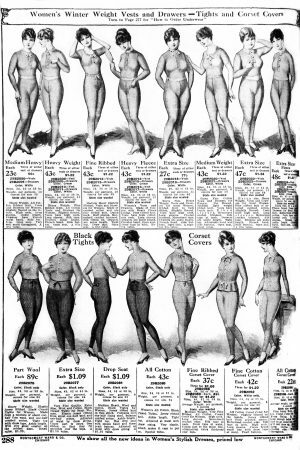 I wonder if young men of 100 years ago would turn to inner pages of the Montgomery Wards catalog, like they later turned to National Geographic, and still later to Victoria’s Secret catalog, to gain insights into the female anatomy? Throughout the book, one can’t help but notice how cautious and pragmatic the copy is. There’s no hyperbole in the sales. Clothes are described as “very serviceable” and “worth-while values”, “dependable” and “moderately priced.” There’s an austere midwestern sensibility here – no suggestive selling. Instead, line up 15 ladies (including a few “extra size” – so not a new thing) and let Madame decide what wool she’ll wear this winter. Apologies for the slightly wobbly image – this especially old catalog hails from a time when paper was cheap and the 9″ x 13″ oversize pages won’t fit in my scanner. So I had to haul out the camera, take a photo, and try to make adjustments in Photoshop. Previous Previous post: The hot new Christmas Gift for 1958: Velcro!